Experience a customized Oregon Wine Tasting at some of the best vineyards in the Southern Willamette Valley. Enjoy the amazing views, wine, education, and fun for all. From the experienced to novice wine tasters, Oregon vineyards have something for everyone. Oregon is home to some of the most beautiful vineyards in the world and is known for its distinctive Pinot Noir. 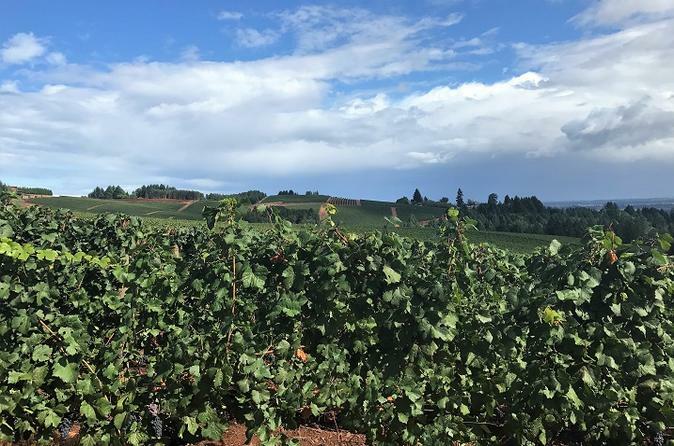 The heart of these vineyards is located in the Willamette Valley on gentle hills that give way to expansive views of the vines and valley below. Join us on our Oregon Wine Tour and experience wine tasting at some of this area’s most popular vineyards in the region. The unique relationship between volcanic Jory soils, elevation and protective micro climates has consistently proven ideal for vineyards, and has produced Oregon’s top Pinot Noir for decades. Enjoy the taste of a select group of Oregon most renowned local vineyards. We chose your winery visit based on season and day of the week and each will have a unique and different experience, from boutique to Estates, to enhance your tour experience. Your Tour Guide will educate you on the region from history to terroir to elevate your wine tasting experience.